Inpatioen Drug Rehabilitation Facilities are very common in which most use the teachings of AA and/or NA 12 step programming. The program promotes living one day at a time. This fact to start with keeps a person standing still in one place. Then there is the fact that they teach the people that they are powerless over a liquid that is in a bottle. Pushing further into this fear based nonsense, you must believe in a "higher-power" or you will go out and drink again. It is also said that you must do the 12 steps exactly, or you are going to go out and drink, or do drugs. Again, fear based nonsense. 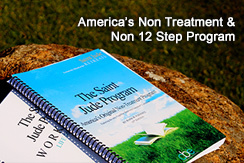 Almost all of the inpatient drug rehabilitation facilities not only teach the 12 steps of AA or NA, they also get you right into the AA or NA meetings outside the facility. Some of them allow outside people to come into the facility to hold the meetings there. What all of this does is keeps a person in the falsehood of being sick and diseased. They say that this is the way it will be for the rest of your life. This happens to be the furthest thing from the truth. The thing here to be looked at strongly is CHOICE. Choices are something that everyone makes every day; the freedom model, which is the social and educational program taught at the Freedom Model retreats, teaches individuals to make the proper and most of all positive CHOICES. By deviating from the diseased concept a person can realize that they hold the power to choose to live a productive and most importantly happy life. With the freedom model individuals establish both short term and long term goals enabling them to progress into a bright future.